Want a chance to win a *free* copy of my new Ellora's Cave release, Punishing the Art Thief? Come today, 9/20/10, to author Darah Lace's blog and leave a comment on my interview! Today I'm pleased to welcome Janet Lane Walters to The Writer's Challenge. She is an Eppie Winning author, with more than 20 books to her credit in both print and electronic format. Hi Janet! So, are you a plotter or a pantser? I had to think about this for a long time because I think I'm both. Yes, I do develop my characters and my plot before I begin and I have a general idea of what kind of scenes will be needed the each story. When I sit down to write, I sort of block out the scene but in an outline order to get the main points down. Then I free-write the rough draft. Actually I'm a re-writer and work from very short to long. There's a draft for getting the story down and then I begin to beat it into shape. I do a plot draft to make sure things are flowing to the end. Often I tear out a scene and totally re-write it taking a slightly different path. There is a setting draft to put all the settings to make sure I've used enough description to put people in the place. Then there's the character draft where I make sure motivation, actions and reactions are in place. Finally I go over the manuscript for word usage, trying to get rid of the passive sentences and the boring bits. Then I finish the book with a spell and grammar check as well as a ruler read. So which am I panster or plotter, I think I get the best of both worlds. Almost a complete panster on the rough draft which is generally about a third of the finished book and plotter on the rest. How do you feel about literary agents? My feeling on literary agents is iffy. If you want to go to New York, they can get you in the door and they can perhaps get you a better deal. Since I've been there and done that and don't intend to leave electronic publishing for me a literary agent would be useless. In the past I have had three agents. Two of them did little to nothing to advance my career. I won't discuss the details. That's between them and me. The third who was my first created a writer's block, my own doing. Part of the problem was that I can't write on demand and I often can't write the same kind of story over and over again. Perhaps if I had been content to stick with contemporary romance or, mysteries or, suspense or, historicals or fantasy an agent would have been a plus. With electronic publishing an agent won't get you in the door any quicker that a good query letter and a short snappy synopsis, often no more than a paragraph of two. An agent won't get you better terms in electronic publishing either. Having an agent depends on your long term goals. At my age, my goals are from day to day. You publish mainly with e-pubs, can you explain the advantages and disadvantages of going with an e-publisher? In the past I've been published in New York with 5 romance novels and 3 non-fiction ghost written books. In 1998 my first ebook was published and I haven't looked back. I like the freedom writing for epublishers gives me. I don't have to stick to one genre or have a half dozen pen names. Epublishing was on the edge of technology when I began and I kind of like the idea of being out there. With the rise in major publishers going electronic with their releases suddenly epublishing has become legit. Years ago when I began you wouldn't believe the names I was called for taking that road. I'm not sure there are that many advantages, except the idea that acceptances and reads are much quicker in the electronic publishing groups. I'm not in this for the money. I enjoy the sales I make and the royalties I recieve. I also like that with many publishers the books on your back list are available for years. The only disadvantage I can see is the money but publishing is in flux at the present time. Who knows what will happen. Another disadvantage is piracy but there are people not only pirating electronic books but pulling apart print books and scanning them in and offering them for free to people who think stealing is fun. Also when my first electronic book was published I joined EPIC which is the Electronically Published group where I've met many new friends and very supportive people. I've learned so much about electronic publishing and promotion from this group. Thanks so much for answering my questions! 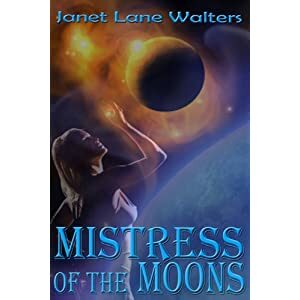 Here's some info on Janet's latest release, Mistress of the Moons. I just bought this book and it's a very imaginative story! and moon-touched Egeria…The Healer to Come. Even as the women reach The Place of Choosing they face yet another test... They reject the teachings of their counterparts after realizing that only by acting with their male partners can they defeat the priests of the Lord of Shadows. Will they survive the final confrontation? Tira has always been fascinated by ancient Egypt, but circumstances and finances have kept her from becoming an archeologist. Her dream of seeing her older sister drug free is shattered by Luci’s murder by a drug dealer. Tira must run to be safe from the killer. A crumpled flyer offers an escape…The answer is in your stars. Tira flees her pursuers and reaches a brownstone where two elderly women cast her horoscope. She is offered refuge but must undertake a dangerous quest. She will be unable to speak of her world, or anything alien to the culture she enters and… she will remain there forever. Kashe is the unloved middle son of the nomarch of Mero. He reminds his father of the Nubian slave ancestor the nomarch wishes to forget. 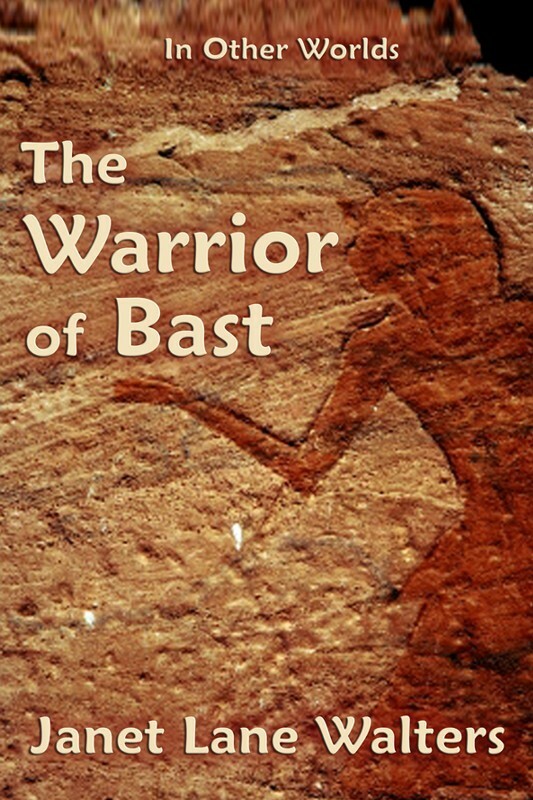 Though Kashe wants to become a warrior of Horu, his father has other plans. A desire for power drives the nomarch. To see his eldest son, Pian, as pharaoh, the nomarch plots with the priests of Aken Re. Since the rebellion twenty years ago the Two Lands has been without a ruler. By making Kashe the leader of the priests' army the nomarch will have his desire satisfied. The arrival of a sacred hawk with an amulet naming Kashe as chosen by Horu thwarts the devious plans. The hawk also delivers a scroll speaking of three who will come from afar and that Kashe must aid one of these, whom he soon discovers is Tira. The pair sets out on the quest for the symbols; the flail, the crook and the double crown. Tira learns this Egypt has many differences from the Egypt she has studied. They must face nearly insurmountable challenges as they pursue their sacred quest. Wow, Janet! Super cover for Mistress of the Moons. Great post! Great interview. I always like hearing what Janet has to say since she has so much experience! Your imagination astounds me. That and experience add up to one amazing woman. Terrific interview, questions and response. Thanks Shana and Janet. That's exactly what I thought, Charmaine - Janet has such an imagination to come up with the stories she does! Sorry I am weighing in late on this. Janet is my inspiration - she was involved with the epubs long before they became popular, and always was willing to look at newbie's work (mine included). Loved this interview - great covers! I'm late too -- been off-line. Janet has molded so many of us at HVRWA. A lot of us would still know zip about writing without her guidance.